When you are vegan, stumbling upon a bakery that makes delectable vegan-friendly treats is as thrilling as being a kid in the Lego aisle of the toy store (ok who am I kidding…the Lego aisle is amazing at any age!). Anyway, it takes a lot for me to get excited about a bakery these days. When you are trying to eat a mostly healthy, natural, vegan diet, most bakeries are off limits; and to tell you the truth, I don’t often crave any of the super sweet, overly processed pastries and cakes that seem to make others swoon. Still, when I learned that a gluten-free (GF), dairy-free bakery called Rising Hearts existed not five minutes from my apartment, my ears perked up. First, I did some sleuthing on their website, which confirmed that their entire bakery is free of gluten and dairy, is kosher, and that they have a tantalizing list of vegan breads and baked goods. The site lists ingredients for most products, and discusses their reasoning for choosing key ingredients. The bakery used to go by the name ‘The Sensitive Baker’, but under new ownership was re-Christened to Rising Hearts Bakery. The Rsing Hearts Bakery website provides nutrition facts for most products. I want to be upfront–I am generally weary of pre-made GF products due to their lack of nutrients and reliance on various potato and corn starches and emulsifying gums, making them fairly processed. These were indeed in the ingredient list for many Rising Heart Bakery products. Most products also contain palm oil or shortening, an ingredient that is causing a lot of controversy. It’s very difficult, if not impossible, to completely avoid palm oil (unless you make absolutely ALL your own food and bath/body products) because it is ubiquitous in most processed foods and toiletries. Palm oil is much cheaper than coconut oil and therefore more cost effective for businesses. But its popularity is causing widespread destruction of virgin rainforest to make way for palm plantations (not to mention that it might contribute to increased inflammation in the body). I try to support brands that use only organic or sustainably sourced palm oil, or better yet, healthier oils like coconut, olive, or rice bran. Rising Heart products also contain canola oil, carrageenan, and cane sugar—none of which is necessarily detrimental in small amounts, but again all are fairly ubiquitous in pre-made and processed foods, so I try to minimize how much of these I consume. However, I was impressed with the number of ‘healthy’ ingredients that Rising Hearts tried to incorporate as well (millet, hemp milk, flax meal, oat flour, rice syrup, etc. ), and their openness about how they source their ingredients—including that it is impossible to verify that some of their ingredients are GMO free. I appreciate honesty, especially when it comes to food preparation. Then I saw the vegan coconut oatmeal and snickerdoodle cookies, and knew I had to to give this place a shot. Within minutes, I was dressed and heading to their Culver City location. Their store is tiny but immediately enticing. I arrived in the morning, so the smell of various baking breads permeated from the back kitchen area. I was greeted warmly by a woman from behind the counter, then left to wander as she helped a prior customer. 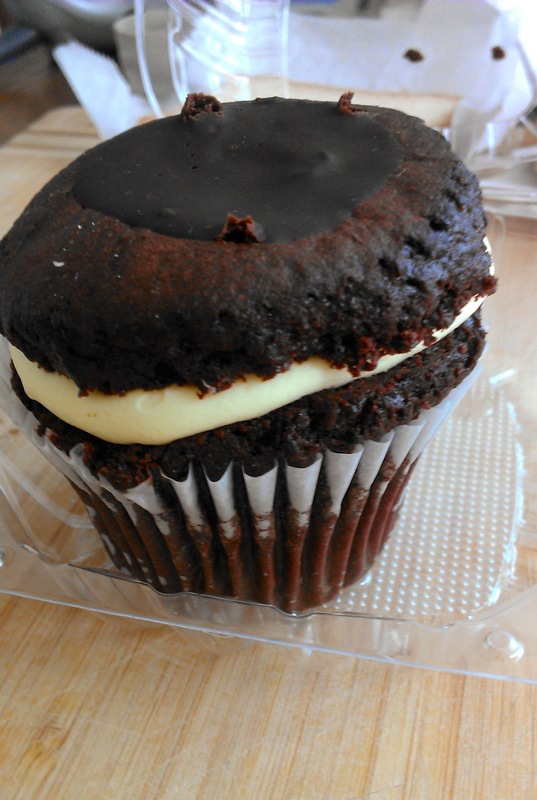 The refrigerated bakery case was filled with an assortment of cupcakes, dessert bars, cookie sandwiches and whoopee pies. On a tall rack against the window, I was distracted for a few minutes by the hand-made granolas, vegan cookies (with classic flavors from chocolate chip to the more exotic quinoa cranberry), and various GF/vegan bread and cookie mixes. Then, I found the freezer case—stacks of vegan muffins (apple oatmeal, sweet potato), breads (millet and oat loafs, sourdough baguettes, bagels), cakes, and more. I was paralyzed by choice! Luckily, at this point another woman stepped out from the back to re-stock the freezer, and I asked her for recommendations. The woman turned out to be the owner, Edie Erwin. She was immediately friendly and helpful. I wanted to taste one of everything they had, but in order to minimize embarrassment (and impact on my bank account) I forced myself to narrow my choices down. 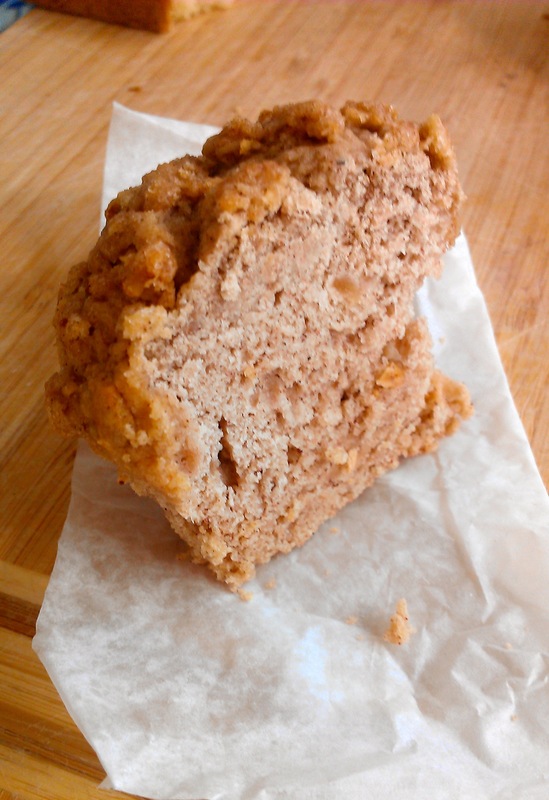 I ended up choosing the apple oat muffins, a loaf of millet bread, a chocolate-banana cupcake, and a coconut oatmeal cookie sandwich with chai frosting filling (see individual reviews below). As I was paying for my bounty, Edie offered me a few slices of Rising Heart’s new vegan GF brioche. She also pointed out the bagel samples next to the register—I don’t think anyone would have been able to tell that those bagels were GF; in fact the texture and taste was richer than nearly any bagel I’ve tried, and I was half raised in Jewish delis! Delectable vegan and GF brioche–how DO they do it?? I barely made it back to my car before stuffing a big chunk of brioche into my mouth, and I was not ready for the mesmerizing buttery softness that seemed to melt on my tongue. Memories of my pre-vegan days in Paris flooded back. If you aren’t familiar with brioche, it is one of those tantalizing, decadent egg and butter filled breads that for vegans is typically relegated to the ‘never again’ pile. So to experience this remarkably light, moist, just slightly sweet bread in vegan form (not to mention GF!) was a special moment. A moment all by myself, in my parked car. Somehow I managed to get the other two slices home for my housemates to try, but I admit it was difficult not to just shove them all in my mouth at once. That good, really. My opinion was reaffirmed by both my boyfriend and his non-vegan, non-GF brother. While the muffins and bread were decent, I would say the real gems of this bakery are the fresh pastries and desserts in the front case, plus the brioche and fresh bagels. Below are my overall conclusions (so far) about Rising Heart, followed by my individual product reviews. *Great selection of cupcake, cookie, and dessert varieties, including many vegan options (all are GF, dairy-free, and kosher). *That vegan brioche was the bomb!! Definitely worth a visit. For those trying to minimize processed foods and/or sugar from their diets, save this bakery for a special treat now and then and for parties or get-togethers with GF and vegan friends. 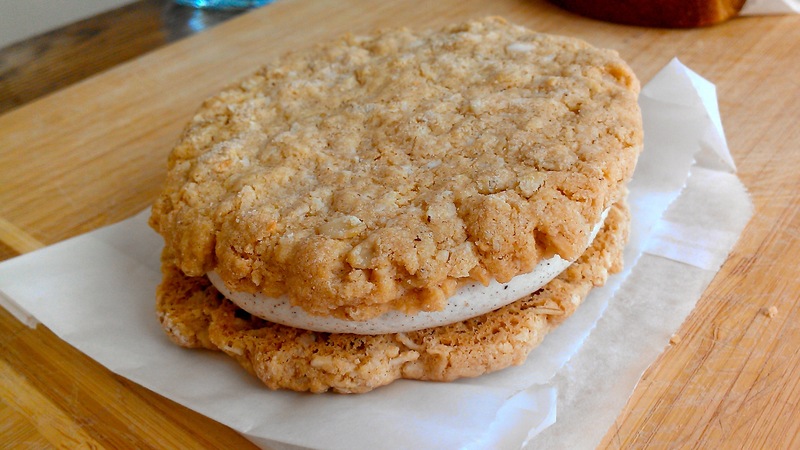 Oatmeal coconut cookie sandwich with chai filling: Decadent, in the best way! Two gi-normous vegan cookies–dense, moist, slightly crumbly, with a rich buttery coconut taste–filled with a generous amount of lightly spiced frosting. Enough to share! Beware–this is a hefty, dense cookie concoction. Chocolate banana cupcake: Again, I was impressed with how moist this GF cupcake was, while still maintaining a nice light texture. The chocolate flavor was rich, and there was just the right amount of sweet and creamy banana frosting to balance the less sweet cake. 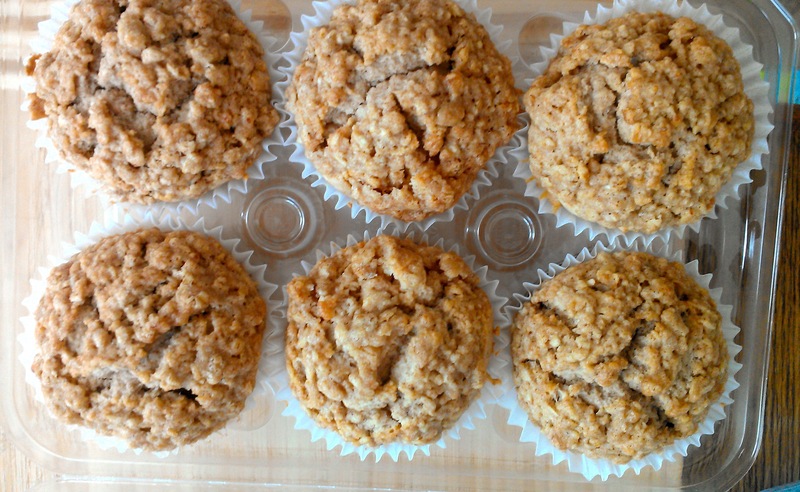 Apple oat muffin: These muffins were in the freezer case, and they come in a package of 6. On the plus side, the muffins were moist and flavorful, but they tasted more like a desert muffin to me–i.e., too sweet, not very healthy tasting. If you like cake-y muffins that remind you of Hostess, this is the muffin for you. 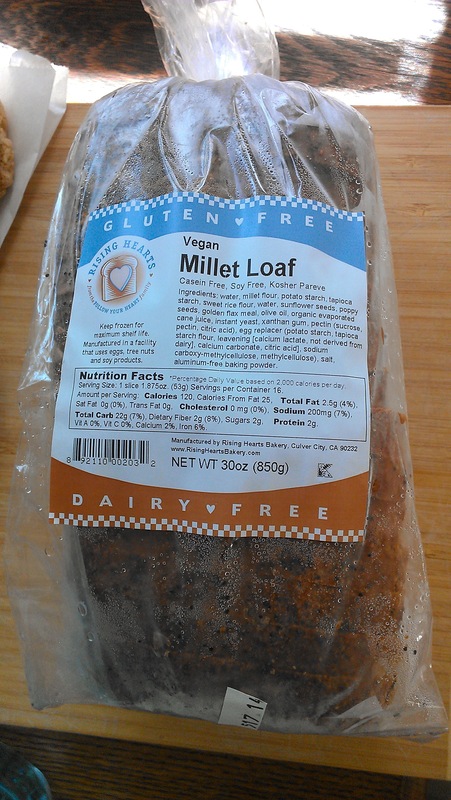 Millet bread: Unlike the fresh bagel and amazing brioche samples I tried, the millet bread had the much more typical GF bread texture one comes to expect with GF products. 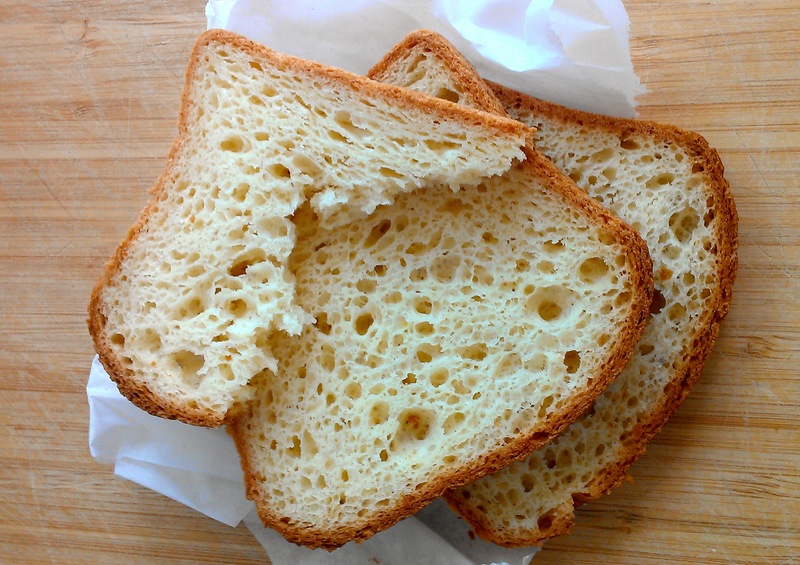 Fairly dry and crumbly when toasted, and slightly more dense than non GF bread. When microwaved the bread is more moist and rich. The flavor was above average–slightly buttery, definitely a nice light millet flavor. But a slice of this bread contains 200 mg of sodium and not much of protein, so this would not be my go to ‘healthy’ bread for toast in the morning. Next time I want to try their oat bread as it might be a better breakfast option. Posted on February 18, 2014, in Bakeries, Desserts and tagged bakery, dairy free, GF, Gluten free, Test, vegan, vegan dessert. Bookmark the permalink. 2 Comments.